In the Aubrey Mss. his presentation to the prebend is thus mentioned, After noticing that bishop Andrews made a point to prefer “ingenidee persons that were sraked to poor livings, and did delitescere,” he adds that the bishop “made it his enquiry to find out such men. 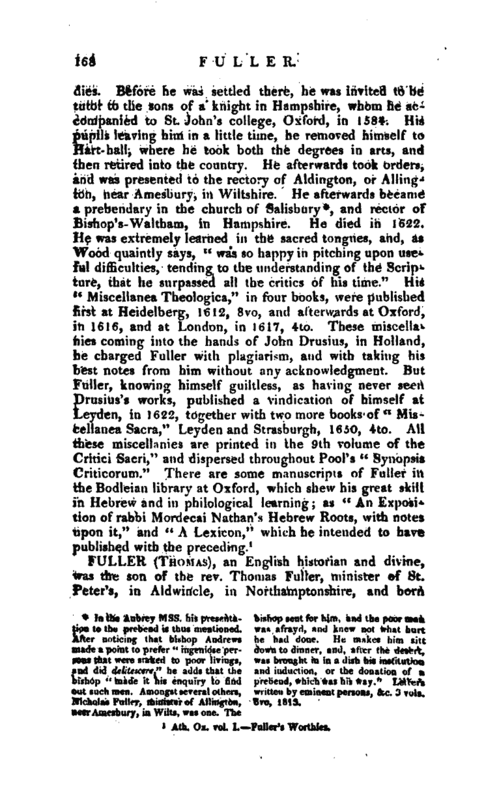 Amongst several others, Nicholas Fuller, minister of Allington, near Amesbury, in Wilts, was one. The bishop sent for him, and the poor man was arrayd, and knew not what hurt he had done. He makes him sit down to dinner, and, after the desert, was brought in in a dish his institution and induction, or the donation of a prebend, which was his way.” Letters written by eminent persons, &c. 3 vols, 8vo, 1813. | there in 1608. The chief assistance he had in the rudiments of learning was from his father, under whom he made so extraordinary a progress, that he was sent at twelve years of age to Queen’s-college, in Cambridge; Dr. Davenant, who was his mother’s brother, being then master of it, and soon after bishop of Salisbury. He took his degrees in arts, that of A. B. in 1624-5, and that of A. M. in 1628, and would have been fellow of the college; but there being already a Northamptonshire man a fellow, he was prohibited by the statutes from being chosen, and although he might have obtained a dispensation, he preferred removing to Sidney-college, in the same university. He had not been long there, before he was chosen minister of St. Bennet’s, in the town of Cambridge, and soon became a very popular preacher. 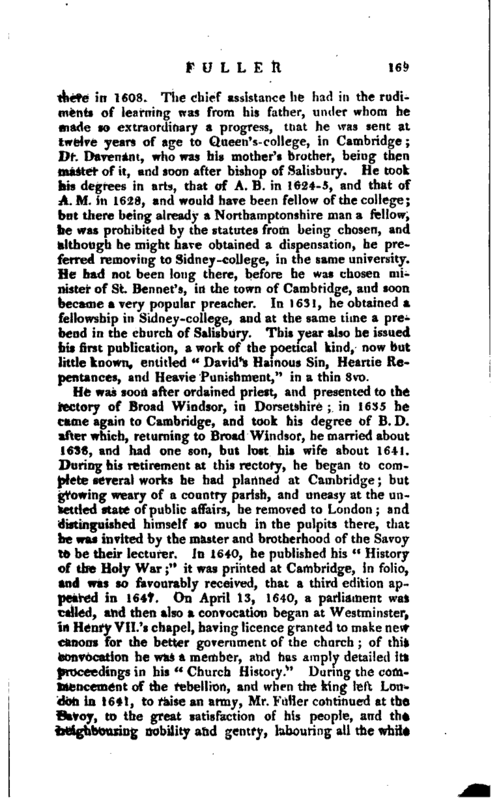 In 1631, he obtained a fellowship in Sidney-college, and at the same time a prebend in the church of Salisbury. This year also he issued his first publication, a work of the poetical kind, now but little known, entitled “David’s Hainous Sin, Heartie Repentances, and Heavie Punishment,” in a thin 8vx>. He was soon after ordained priest, and presented to the rectory of Broad Windsor, in Dorsetshire; in 1635 he came again to Cambridge, and took his degree of B. D. after which, returning to Broad Windsor, he married about 1638, and had one son, but lost his wife about 1641. During his retirement at this rectory, he began to complete several works he had planned at Cambridge; but growing weary of a country parish, and uneasy at the unsettled state of public affairs, he removed to London; and distinguished himself so much in the pulpits there, that he was invited by the master and brotherhood of the Savoy to be their lecturer. In 1640, he published his “History f the Holy War;” it was printed at Cambridge, in folio, and was so favourably received, that a third edition appeared in 1647. 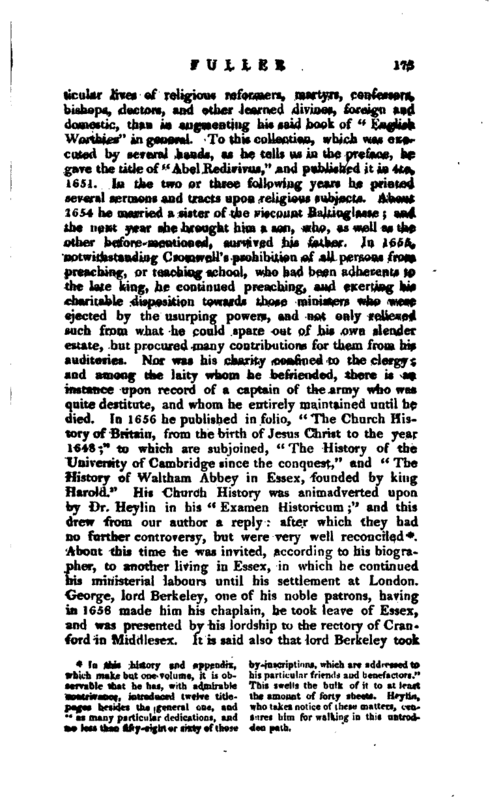 On April 13, 1640, a parliament was called, and then also a convocation began at Westminster, in Henry VII.‘s chapel, having licence granted to make new canons for the better government of the church; of this convocation he was a member, and has amply detailed its proceedings in his “Church History,” During the commencement of the rebellion, and when the king left London in 1641, to raise an army, Mr. Fuller continued at the Savoy, to the great satisfaction of his people, and the neighbouring nobility and gentry, labouring all the while | in private and in public to serve the king. To this end, on. the anniversary of his inauguration, March 27, 1642, he preached at Westminster-abbey, on this text, 2 Sam. xix. 30: “Yea, let him take all, so that my lord the king return in peace;” which being printed, gave great offence to those who were engaged in the opposition, and brought the preacher into no small danger. He soon found that he must expect to be silenced and ejected, as others had been; yet desisted not, till he either was, or thought himself unsettled. This appears from what he says in the preface to his “Holy State,” which was printed in folio that same year at Cambridge. This is a collection of characters, moral essays and lives, ancient, foreign, and domestic. The second edition of 1648, contains “Andronicus, or the unfortunate politician,” originally printed by itself in 1646, 12mo. In 1643, refusing to take an oath to the parliament, unless with such reserves as they would not admit, he was obliged in April of that year to convey himself to the king at Oxford, who received him gladly. As his majesty had heard of his extraordinary abilities in the pulpit, he was now desirous of knowing them personally; and accordingly Fuller preached before him at St. Mary’s church. His fortune upon this occasion was very singular. 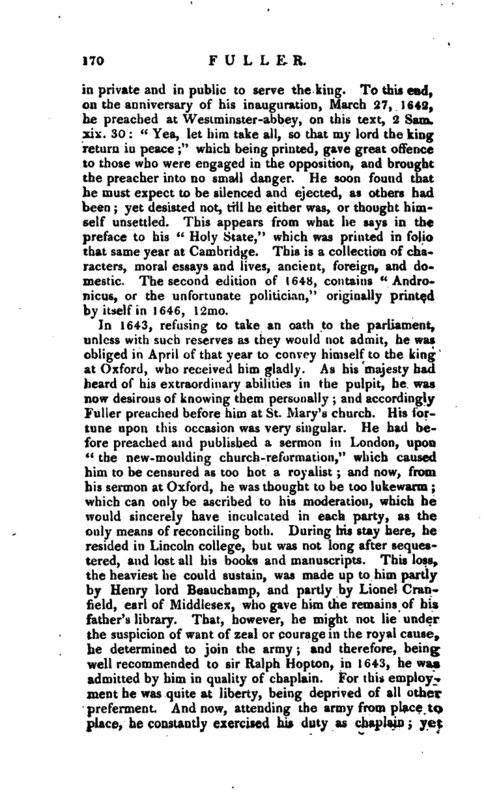 He had before preached and published a sermon in London, upon “the new-moulding church-reformation,” which caused him to be censured as too hot a royalist and now, from his sermon at Oxford, he was thought to be too lukewarm which can only be ascribed to his moderation, which he would sincerely have inculcated in each party, as the only means of reconciling both. During his stay here, he resided in Lincoln college, but was not long after sequestered, and lost all his books and manuscripts. This loss, the heaviest he could sustain, was made up to him partly by Henry lord Beauchamp, and partly by Lionel Cranfield, earl of Middlesex, wiio gave him the remains of his father’s library. 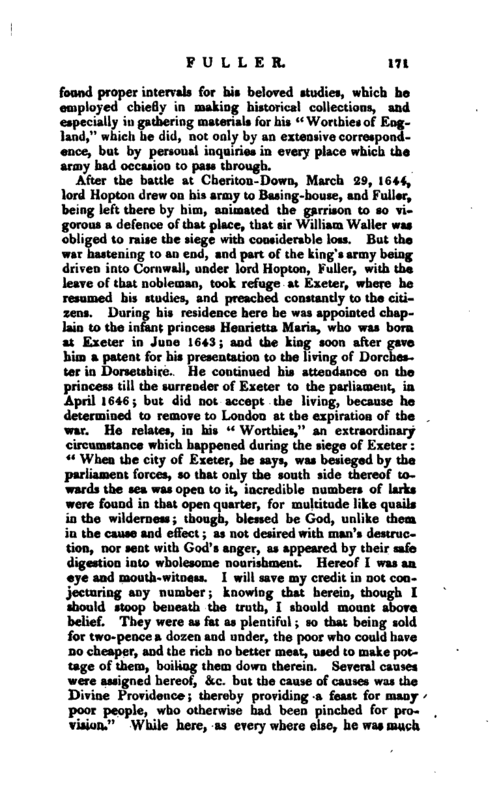 That, however, he might not lie under the suspicion of want of zeal or courage in the royal cause, be determined to join the army; and therefore, being well recommended to sir Ralph Hopton, in 1643, he was admitted by him in quality of chaplain. For this employ-, ment he was quite at liberty, being deprived of all other preferment. 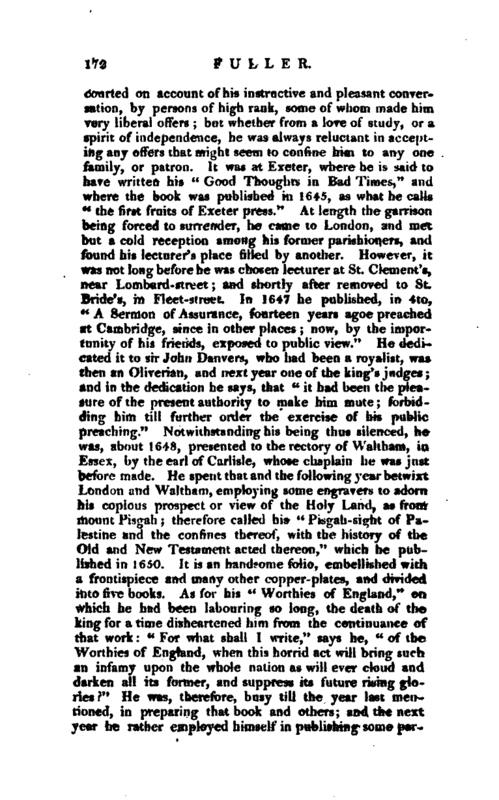 And now, attending the army from place to place, he constantly exercised his duty as chaplain; yet | found proper intervals for his beloved studies, which he employed chiefly in making historical collections, and especially in gathering materials for his “Worthies of England,” which he did, not only by an extensive correspondence, but by personal inquiries in every place which the army had occasion to pass through. 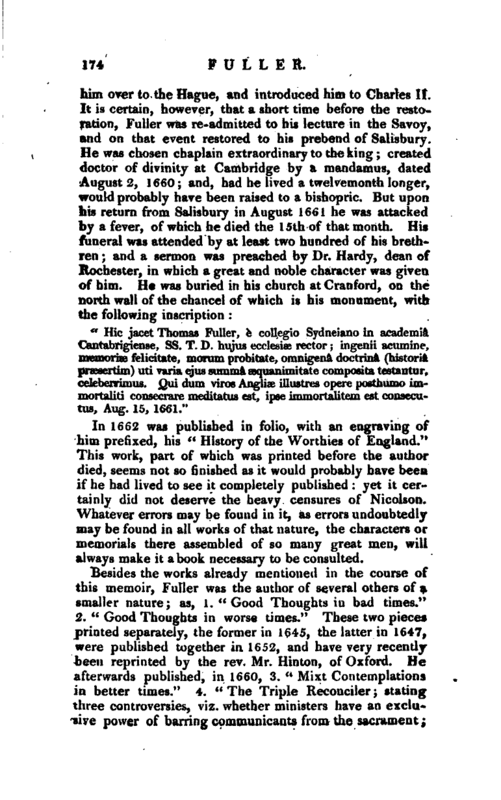 In this history and appendix, hywhich make but one volume, it is observable that he has, with admirable contrivance, introduced twelve title-­pages besides the general one, and “as many particular dedications, and ug less than fifty-eight or sixty of thee inscriptions, which are addressed to his particular friends and benefactors.” This swells the bulk of it to at least the amount of forty sheett. H<-ylin, who takes notice of these matters, cencures him for walking in this uutrodden path. In 1662 was published in folio, with an engraving of him prefixed, his “History of the Worthies of England.” This work, part of which was printed before the author died, seems not so finished as it would probably have beeu if he had lived to see it completely published: yet it certainly did not deserve the heavy censures of Nicolson. Whatever errors may be found in it, as errors undoubtedly may be found in all works of that nature, the characters or memorials there assembled of so many great men, will always make it a book necessary to be consulted. 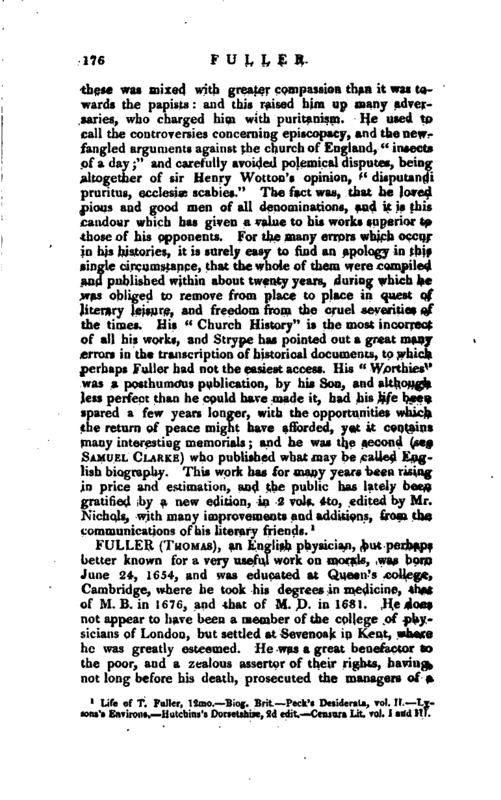 Besides the works already mentioned in the course of this memoir, Fuller was the author of several others of a smaller nature; as, l.“Good Thoughts in bad times.” 2. “Good Thoughts in worse times.” These two pieces printed separately, the former in 1645, the latter in 1647, were published together in 1652, and have very recently been reprinted by the rev. Mr. Hinton, of Oxford. He afterwards published, in 1660, 3. “Mixt Contemplations in better times.” 4. “The Triple Reconciler; stating three controversies, viz. whether ministers have an exclusive power of barring communicants from the sacrament; | whether any person unordained may lawfully preach; and whether the Lord’s Prayer ought not to be used by all Christians, 1654,” 8vo. 5. “The speech of birds, also of flowers, partly moral, partly mystical, 1660,” 8vo. A work entitled “T. Fuller’s Triana; or three-fold Romanza of Mariana, Paduana, and Sabina,” 1662, 12mo, is attributed to him in some catalogues. He published also a great many sermons, separately and in volumes. Of the powers of his memory, such wonders are related as are not quite credible. He could repeat five hundred strange words after twice hearing, and could make use of a sermon verbatim, if he once heard it. He undertook, in passing from Temple-bar to the farthest part of Cheapside, to tell at his return every sign as it stood in order on both sides of the way, repeating them either backwards or forwards: and he did it exactly. 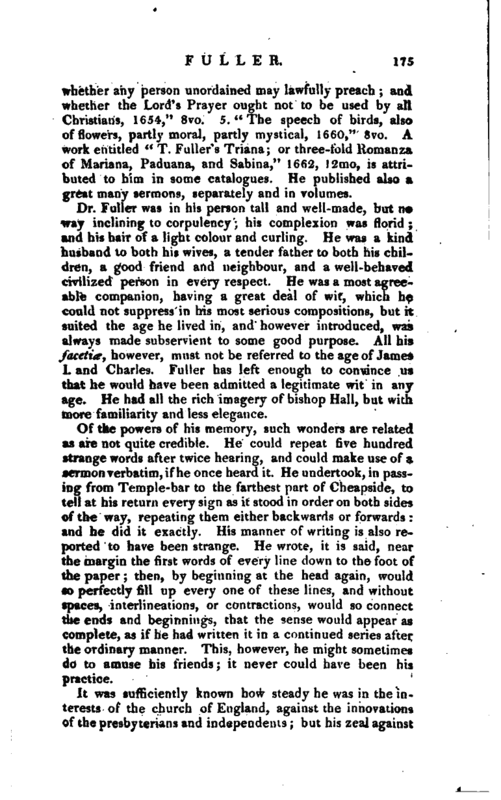 His manner of writing is also reported to have been strange. He wrote, it is said, near the margin the first words of every line down to the foot of the paper; then, by beginning at the head again, would so perfectly fill up every one of these lines, and without spaces, interlineations, or contractions, would so connect the ends and beginnings, that the sense would appear as complete, as if he had written it in a continued series after the ordinary manner. This, however, he might sometimes do to amuse his friends; it never could have been his practice.